1) Preheat oven to 180oc. Rub flour, salt and butter together until it is the consistency of breadcrumbs. 2) Add baking powder, sugar, vanilla, rum, lemon zest, mixed spice, suet, dried fruits, almonds. Mix in the creme fraiche and egg to form a dough. 3) On a floured surface roll to form an oblong 15cm x 23cm x 2cm. Form the marzipan in a sausage shape and place in the middle. Fold dough over marzipan and seal. 4) Place on a baking sheet seam side down and bake for 25-30min. 5) Once cooked remove from the oven and place on a wire rack. Brush liberally with melted butter and dust with lots of icing sugar. Allow to cool. 6) Wrap tightly in foil. Keeps for 2-3 weeks. Personally I find the flavour and texture improves after a week. 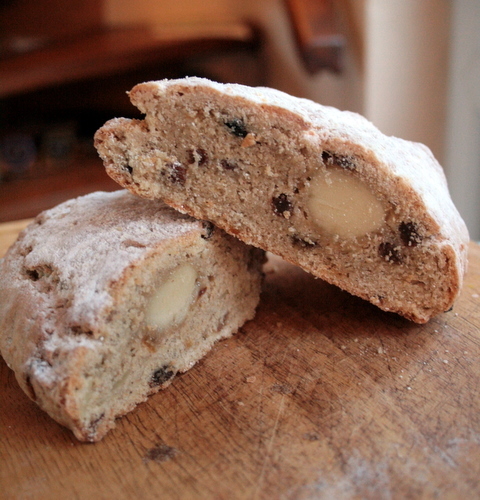 Posted on December 15, 2011, in baking, Bread, Cake and tagged baking, Christmas, Germany, marzipan, stollen. Bookmark the permalink. 10 Comments.